I’m working up to some over hauls to my website. I already have a “Special for ADHD” page which I hope is helpful for some people… You know who you are. But that’s not my whole target audience. Today, my engineer husband explained to me that I would offend both groups if I did. He says, “Engineer is a profession. Geek is a life style.” Further, engineers do not want to be called geeks which is somehow “less than” and geeks see engineers as old farts. I don’t know if it’s true. But it’s an interesting predicament for me. I see the best of both groups as people with lots of ideas, showing creativity in ways that would not necessarily impress a 7th grade art teacher. BUT it’s precisely their kind of creativity that gets bridges built, gets electricity to work in my iron (Ha! If I knew where it was! ), gets this blog to work so simply that probably my mother, if she wanted to, could figure out how to comment on this. Geeks didn’t really exist when my dad died in 1982. Nerds, yes. But they were different. Here’s a story. My father played piano — methodically, not beautifully. You could recognize the tunes. But he was an engineer. And so his greatest pleasure was figuring out how to make a piano play itself. 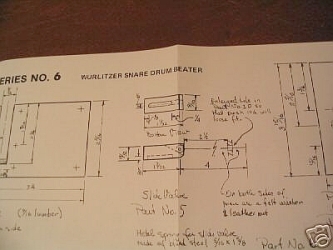 This picture is of one of the plans he made for building a Wurlitzer snare drum beater. He’d borrow a part. Build two like it. Return the borrowed one. Keep the one he needed; one he’d sell. He’d also make up the plans and sell them. I found this set on eBay about 25 years after he died! That whole different way of seeing things fascinates me. And what fascinates me is what keeps me doing this coaching work with people I really like! This entry was posted in Geekness on 7/4/2007 by Kerch McConlogue.